Environmental groups across the U.S. and Canada are celebrating after President Obama's rejection of the Keystone XL pipeline. The pipeline, which would transfer oil from Alberta's tar sands to the Gulf of Mexico, would pose a threat not only to the communities surrounding it, but to Americans in general, due to its threat to the food system. Extracting and processing oil from tar sands would release an enormous amount of carbon into the atmosphere while poisoning the land and water of local communities, environmental groups assert. Furthermore, if the 1,700-mile pipeline burst, it would devastate surrounding communities and farms. The pipeline would also devastate pristine boreal forest in Canada, further contributing to rising carbon levels in the atmosphere. James Hansen, a leading NASA climate scientist who has been arrested in climate justice actions and active in the pipeline protests, has called the pipeline "the fuse to the biggest carbon bomb on the planet." In a recent interview, Hansen also stated, "What makes tar sands particularly odious is that the energy you get out in the end, per unit carbon dioxide, is poor. It's equivalent to burning coal in your automobile. We simply cannot be that stupid if we want to preserve a planet for our children and grandchildren." According to independent studies, the pipeline would not lower oil prices for Americans - in fact, it would cause them to rise, though tax payers would foot the bill for construction. Food prices would likely rise also, as farmers paid more for their energy. Nor would employment raise significantly. The Washington Post Fact Checker debunked the claims that the pipeline would provide the vast numbers of jobs that industry claims - claims spouted by a study funded by TransCanada Corp., the company seeking to build the pipeline. The industry's job claims not only include jobs directly related to the pipeline, but jobs related to the hospitality industry and others that would benefit indirectly from the pipeline. Some of these "jobs" would likely displace business in other areas while providing business to communities surrounding the pipeline. Others, such as "shampooers," "choreographers," and "manicurists," are not linked to the pipeline through any stretch of logic. Furthermore, jobs linked directly to the pipeline would be mainly short-term and low-paying. Their numbers are highly overrated, too, counting each year of employment as a separate job. The real number of jobs? About 50, at best, according to the Cornell Labor Institute - the pipeline may kill more jobs than it adds, due to raising energy costs, the study found. 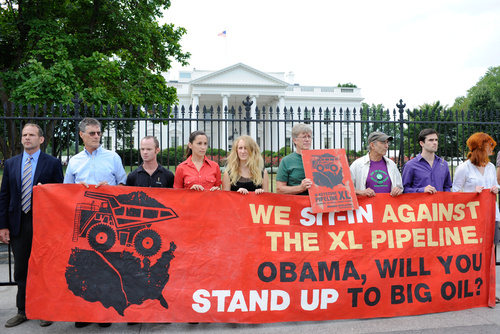 The Keystone XL pipeline has sparked a wave of activism in the environmental and social justice movement. In August 2011, a massive act of civil disobedience against the pipeline led to hundreds of arrests. In early November, over 12,000 people encircled the White House in protest of the pipeline. Just before Obama's decision, a group of concerned citizens and activists (myself included) mic checked Jack Gerard - president of the American Petroleum Institute, the industry's head lobbying organization - at the State of the Energy Industry 2012 luncheon today (January 18) in Washington, D.C. Calling out "Fact check!" we highlighted the devastation the pipeline would cause and the negative impacts it would have on our economy. Gerard has threatened that refusing to allow the pipeline would have "huge political consequences." Our aim was to give President Obama a last minute push, via media attention, to make the responsible decision. Dan Moglen of Friends of the Earth said, "The Keystone XL fight was David versus Goliath; no one thought we could win," in an ABC news interview. Despite the billions the oil industry spent on lobbying and advertising, the president seems, in this case, to have listened to the people instead. TransCanada Corp. will have the opportunity to resubmit the proposal after reworking the route, but the wave of activism against the pipeline shows no signs of stopping.